“I fell in love with London Terrace the first time I ever saw it back in 1989 when I first arrived in NY. What a heroic building! I had never seen a building like it. Giuseppe has a Masters Degree in Architecture and Urban Design from the Universita’ di Napoli, Italy (1989), and has completed post-graduate studies at Columbia University, New York (1991). 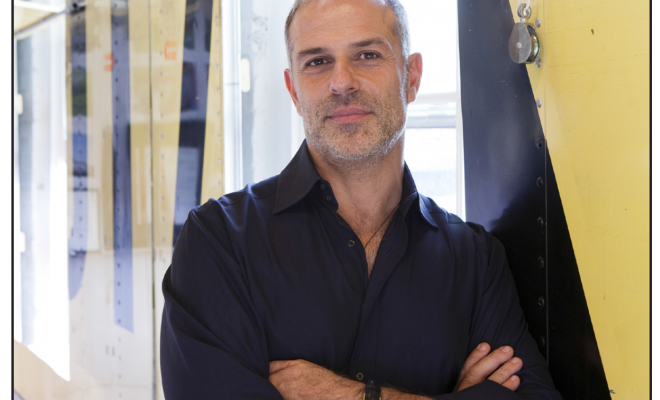 He founded LOT-EK with Ada Tolla in 1993 in New York and Naples as a research and design practice. LOT-EK has achieved high visibility for their sustainable and innovative approach to construction, materials and space, through the “upcycling” of existing industrial objects and systems not originally intended for architecture. Their projects have been published in The New York Times, London Times, Herald Tribune, WSJ, Wallpaper, Mark, Domus, A+U, Interior Design, Wired, Surface, Metropolis, Vogue, Graphis and more. Besides heading LOT-EK, Giuseppe currently teaches at Columbia University’s Graduate School of Architecture, Planning and Preservation in New York. He has also taught at Massachusetts Institute of Technology’s Department of Architecture and at Syracuse University’s School of Architecture and lectures at major universities and cultural institutions globally. Giuseppe was recently recognized as a United States Artists (USA) Booth Fellow of Architecture and Design. Nominations are made annually by an anonymous group consisting of arts leaders, critics, scholars, and artists, all selected by USA, of artists they believe show an extraordinary commitment to their craft.